There are few times when television takes my breath away, but I just watched 30 minutes of television that did just that. 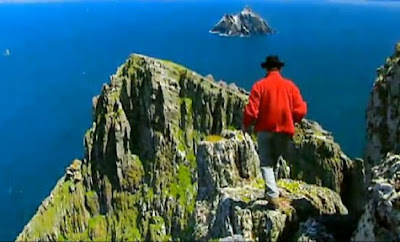 It was a half hour documentary on Skellig Michael, the rock in the Atlantic off the southwest coast of County Kerry. I've seen Skellig Michael in many photographs and even one or two video clips and other documentaries, but I've never seen it like it was presented in tonight's show. Not only was the island looking great, but we got to follow the show's host as he climbed all over the rock, up to the rocky summit and down the narrow ledge of the ancient pilgrim's trail. All the while he was providing a great lesson on the rock's 1500 year history as a monastery and lighthouse location. If you have 30 minutes to spare, you won't be sorry if you spend it watching this. You can see Part 1 here and Part 2 here. If you do you'll finish with a desperate urge to visit Skellig Michael yourself.